Have a great start to the morning with breakfast at Fine Dining and indulge in freshly baked bread and original jam as well as housemade galette based on wheat harvested from our on-site farm. Daily changing main dishes to choose from are also available, next to enjoying a breakfast buffet full of fresh juices, vegetables and fruits. Try our cold pressed juices made of nutrient rich vegetables of local produce and delight in a breakfast full of housemade jam, local honey and seasonal vegetables and fruits. Enjoy a sumptuous dinner course with marinated yellowtail and charcoal-grilled beef, as well as other dishes prepared with the finest local ingredients. “Horse sashimi carpaccio,” a specialty of Puglia, Italy, is served with fig compote and selected grilled tenderloin topped with mozzarella cheese. Sit by the poolside with a glass of cold juice rich in Vitamin C, made from freshly squeezed Goya, grapefruit, and honey. 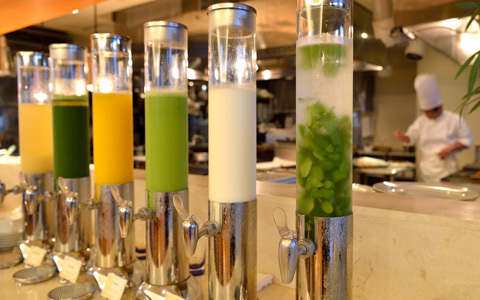 Enjoy fresh tasting tropical drinks made with melon liquor, Campari, coconut syrup, and herbs such as lemon grass. An original drink made with banana smoothie and espresso coffee poured over it. Dine in our exquisite terrace with locally sourced ingredients. Horse Mackerel and marinated Sea Snails with jellied Hijiki sea kelp, charred Akajin groupers and Black Wagyu fillet. Since the Ryukyu Kingdom era, distilled liquor, Awamori has been enjoyed both domestically and abroad. Take a sip of an aged Awamori, an icon of Okinawan spirits. Indulge in a splendid breakfast buffet with main dishes to choose from. Find out about our smoothies of local produce.